ROANOKE, Va. - The National Weather Service has parts of the Roanoke Valley, Southside and the New River Valley in a flash flood watch Saturday through Monday. Florence will bring showers and thunderstorms to southwest Virginia over the weekend and into early next week. This will result in significant flooding across the region. Expect scattered showers and thunderstorms throughout the day. Pockets of heavy rainfall will be possible from time to time. Isolated flooding is a concern. 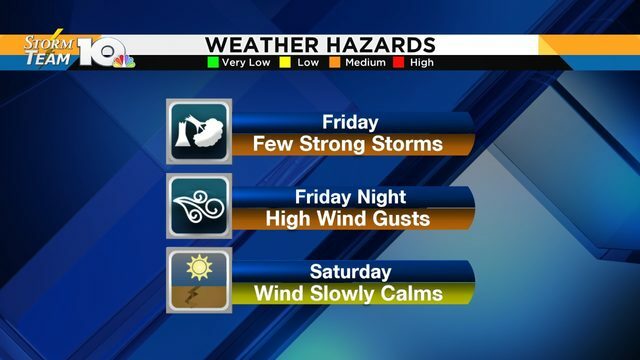 Wind gusts of 30 to 45 mph will be possible Saturday through Sunday. A wind advisory is in effect for Grayson, Carroll and Patrick counties from 4 p.m. Saturday until Sunday afternoon. Widespread spread heavy rainfall is expected as Florence pushes nearby and then to the northeast. Significant flash flooding will be possible across the region. The wind will remain strong and gusty Sunday. Between the heavy rain falling on already saturated ground and gusty winds, there is an increased potential for downed trees and mudslides. As a result, be sure to have an emergency kit ready in case of a prolonged period without power.